I study the ecology and conservation of streams, with a particular interest in migratory species. 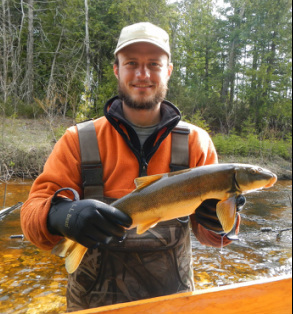 My thesis research focuses on nutrient transfers by massive sucker fish migrations into Great Lakes tributaries. We have found that, although few suckers die and decompose in the streams, suckers can fertilize their spawning grounds with gametes and excretion. The nutrients delivered by suckers can dominate stream nutrient budgets during the migration and drive increases in algal and insect productivity. I am also examining how the timing of migrations and other ecological events is shifting due to climate change and altering species interactions.